Tiffany & Co. pitcher. c. 1871. Pitcher has paneled sides, and repoussé design with shells, scrolls and flowers. Top edge is repousse arrowhead leaf design. 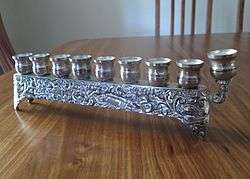 A Macedonian sterling silver Hanukkah menorah. A Chinese export sterling silver punch bowl, c. 1875 (from the Huntington Museum of Art). One of the earliest attestations of the term is in Old French form esterlin, in a charter of the abbey of Les Préaux, dating to either 1085 or 1104. The English chronicler Orderic Vitalis (1075 – c. 1142) uses the Latin forms libræ sterilensium and libræ sterilensis monetæ. The word in origin refers to the newly introduced Norman silver penny. According to the Oxford English Dictionary, the most plausible etymology is derivation from a late Old English steorling (with (or like) a "little star"), as some early Norman pennies were imprinted with a small star. There are a number of obsolete hypotheses. One suggests a connection with starling, because four birds (in fact martlets) were depicted on a penny of Edward I. Another argument is that the Hanseatic League was the origin for both the origin of its definition and manufacture, and in its name is that the German name for the Baltic is "Ost See", or "East Sea", and from this the Baltic merchants were called "Osterlings", or "Easterlings". In 1260, Henry III granted them a charter of protection. Because the League's money was not frequently debased like that of England, English traders stipulated to be paid in pounds of the Easterlings, which was contracted to sterling. and land for their Kontor, the Steelyard of London, which by the 1340s was also called "Easterlings Hall", or Esterlingeshalle. The Hanseatic League was officially active in the London trade from 1266 to 1597. This etymology may have been first suggested by Walter de Pinchebek (ca. 1300) with the explanation that the coin was originally made by moneyers from that region. The claim has also been made in Henry Spelman's glossary (Glossarium Archaiologicum) as referenced in Commentaries on the Laws of England. Yet another claim on this same hypothesis is from Camden, as quoted in Chamber's Journal of Popular Literature, Science and Arts, Volume 4. By 1854, the tie between Easterling and Sterling was well-established, as Ronald Zupko quotes in his dictionary of weights. The British numismatist Philip Grierson disagrees with the "star" etymology, as the stars appeared on Norman pennies only for the single three-year issue from 1077–1080 (the Normans changed coin designs every three years). Grierson's proposed alternative is that "sterling" derives from "ster"[note 1] meaning "strong" or "stout", by analogy with the Byzantine solidus, originally known as the solidus aureus meaning "solid gold" or "reliable gold". In support of this he cites the fact that one of the first acts of the Normans was to restore the coinage to the consistent weight and purity it had in the days of Offa, King of Mercia. This would have been perceived as a contrast to the progressive debasement of the intervening 200 years, and would therefore be a likely source for a nickname. S.E. Rigold disputes the origin being Norman, stating, "that, while medieval British coins seldom copy or are copied by those of France, they have many typological connexions with the lands to the east—the Netherlands, the Baltic, Germany, and even deeper regions of central Europe." Norman silver pennies changed designs every three years. 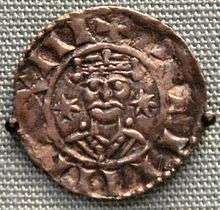 This two-star design (possible origin of the word "sterling"), issued by William the Conqueror, is from 1077–1080. The sterling alloy originated in continental Europe and was being used for commerce as early as the 12th century in the area that is now northern Germany. In England the composition of sterling silver was subject to official assay at some date before 1158, during the reign of Henry II, but its purity was probably regulated from centuries earlier, in Saxon times. A piece of sterling silver dating from Henry II's reign was used as a standard in the Trial of the Pyx until it was deposited at the Royal Mint in 1843. It bears the royal stamp ENRI. REX ("King Henry") but this was added later, in the reign of Henry III. The first legal definition of sterling silver appeared in 1275, when a statute of Edward I specified that 12 ounces of silver for coinage should contain 11 ounces 2 1⁄4 pennyweights of silver and 17 3⁄4 pennyweights of alloy, with 20 pennyweights to the Troy ounce. In Colonial America, sterling silver was used for currency and general goods as well. Between 1634 and 1776, some 500 silversmiths created items in the “New World” ranging from simple buckles to ornate Rococo coffee pots. Although silversmiths of this era were typically familiar with all precious metals, they primarily worked in sterling silver. The colonies lacked an assay office during this time (the first would be established in 1814), so American silversmiths adhered to the standard set by the London Goldsmiths Company: sterling silver consisted of 91.5 - 92.5% by weight silver and 8.5–7.5 wt% copper. Stamping each of their pieces with their personal maker's mark, colonial silversmiths relied upon their own status to guarantee the quality and composition of their products. Colonial silversmiths used many of the techniques developed by those in Europe. Casting was frequently the first step in manufacturing silver pieces, as silver workers would melt down sterling silver into easily manageable ingots. Occasionally, they would create small components (e.g. teapot legs) by casting silver into iron or graphite molds, but it was rare for an entire piece to be fabricated via casting. Next, silversmiths would forge the ingots into the shapes they desired, often hammering the thinned silver against specially shaped dies to "mass produce" simple shapes like the oval end of a spoon. This process occurred at room temperature, and thus is called “cold-working”. The repeated strikes of the hammer work hardened (sterling) silver, causing it to become brittle and difficult to manipulate. To combat work-hardening, silversmiths would anneal their pieces—heat it to a dull red and then quench it in water—to relieve the stresses in the material and return it to a more ductile state. Hammering required more time than all other silver manufacturing processes, and therefore accounted for the majority of labor costs. Silversmiths would then seam parts together to create incredibly complex and artistic items, sealing the gaps with a solder of 80 wt% silver and 20 wt% bronze. Finally, they would file and polish their work to remove all seams, finishing off with engraving and a maker’s mark. The American revolutionary Paul Revere was regarded as one of the best silversmiths from this “Golden Age of American Silver.” Following the Revolutionary War, Revere acquired and made use of a silver rolling mill from England. Not only did the rolling mill increase his rate of production—hammering and flattening silver took most of a silversmith’s time—he was able to roll and sell silver of appropriate, uniform thickness to other silversmiths. He retired a wealthy artisan, his success partly due to this strategic investment. Although he is celebrated for his beautiful hollowware, Revere made his fortune primarily on low-end goods produced by the mill, such as flatware. With the onset of the first Industrial Revolution, silversmithing declined as an artistic occupation. From about 1840 to 1940 in the United States and Europe, sterling silver cutlery (US: 'flatware') became de rigueur when setting a proper table. There was a marked increase in the number of silver companies that emerged during that period. The height of the silver craze was during the 50-year period from 1870 to 1920. Flatware lines during this period sometimes included up to 100 different types of pieces. A number of factors converged to make sterling fall out of favor around the time of World War II. The cost of labor rose (sterling pieces were all still mostly handmade, with only the basics being done by machine). Only the wealthy could afford the large number of servants required for fancy dining with ten courses. And changes in aesthetics resulted in people desiring simpler dinnerware that was easier to clean. knives (dinner knife, place knife, butter spreader, fruit knife, cheese knife). This was especially true during the Victorian period, when etiquette dictated no food should be touched with one's fingers. Serving pieces were often elaborately decorated and pierced and embellished with ivory, and could include any or all of the following: carving knife and fork, salad knife and fork, cold meat fork, punch ladle, soup ladle, gravy ladle, casserole-serving spoon, berry spoon, lasagna server, macaroni server, asparagus server, cucumber server, tomato server, olive spoon, cheese scoop, fish knife and fork, pastry server, petit four server, cake knife, bon bon spoon, salt spoon, sugar sifter or caster and crumb remover with brush. Cutlery sets were often accompanied by tea sets, hot water pots, chocolate pots, trays and salvers, goblets, demitasse cups and saucers, liqueur cups, bouillon cups, egg cups, plates, napkin rings, water and wine pitchers and coasters, candelabra and even elaborate centerpieces. The interest in sterling extended to business (sterling paper clips, mechanical pencils, letter openers, calling card boxes, cigarette cases), to the boudoir (sterling dresser trays, mirrors, hair and suit brushes, pill bottles, manicure sets, shoehorns, perfume bottles, powder bottles, hair clips) and even to children (cups, cutlery, rattles, christening sets). Evidence of silver and/or silver-alloy surgical and medical instruments has been found in civilizations as early as Ur, Hellenistic-era Egypt and Rome, and their use continued until largely replaced in Western countries in the mid to late 20th century by cheaper, disposable plastic items. Its natural malleability is an obvious physical advantage, but it also exhibits medically specific utility, including the fact that it is naturally aseptic, and, in respect of modern medical practices, it is resistant to antiseptics, heat sterilisation and body fluids. Due to sterling silver having a special sound character, some brasswind instrument manufacturers use 92.5% sterling silver as the material for making their instruments, including the flute and saxophone. For example, some leading saxophone manufacturers such as Selmer and Yanagisawa have crafted some of their saxophones from sterling silver, which they believe will make the instruments more resonant and colorful in timbre. Chemically, silver is not very reactive—it does not react with oxygen or water at ordinary temperatures, so does not easily form a silver oxide. However, it is attacked by common components of atmospheric pollution: silver sulfide slowly appears as a black tarnish during exposure to airborne compounds of sulfur (byproducts of the burning of fossil fuels and some industrial processes), and low level ozone reacts to form silver oxide. As the purity of the silver decreases, the problem of corrosion or tarnishing increases because other metals in the alloy, usually copper, may react with oxygen in the air. The black silver sulfide (Ag2S) is among the most insoluble salts in aqueous solution, a property that is exploited for separating silver ions from other positive ions. Sodium chloride (NaCl) or common table salt is known to corrode silver-copper alloy, typically seen in silver salt shakers where corrosion appears around the holes in the top. ↑ Fr. the ancient Greek στερεός [stereos] = 'solid'. ↑ The Journal of the Manchester Geographical Society, Volumes 19–20. Retrieved 2016-09-16. ↑ Family, Commerce, and Religion in London and Cologne. Retrieved 2016-09-16. ↑ "sterling, n.1 and adj.". OED Online. December 2011. Oxford University Press. Entry 189985 (accessed February 28, 2012). ↑ Commentaries on the Laws of England. Retrieved 2016-09-19. The most plausible opinion seems to be that adopted by those to etymologists, that the name was derived from the Esterlingi, or Easterlings, as those Saxons were anciently called who inhabited that district of Germany now occupied by the Hanse Towns and their appendages, the earliest traders in modern Europe. ↑ Chamber's Journal of Popular Literature, Science and Arts, Volume 4. December 10, 1887. p. 786. In the time of King Richard I., monie coined in the east parts of Germanie began to be of especial request in England for puritie thereof, and was called Easterling monie, as all the inhabitants of those parts were called Easterlings; and shortly after, some of the countrie skillfull in mint matters and alloys were sent into this realme to bring the coin to perfection; which since that time was called of them Sterling, for Easterling. ↑ Zupko, Ronald Edward (1985). A Dictionary of Weights and Measures for the British Isles. Independence Square Philadelphia: American Philosophical Society. ISBN 978-0-87169-168-2. In England the term "sterling," originally "easterling," and in france the synonymous term "esterlin," were used to denote the twentieth part of the ounce, also called "penny" in England, and "denier," from denarius, in France. ↑ Grierson, Philip. Anglo-Saxon Coins: Studies Presented to F.M. Stenton on the Occasion of His 80th Birthday, 17 May, 1960, edited by R.H.M. Dolley. Taylor & Francis. pp. 266–283. GGKEY:1JURCGTRPJ8. Retrieved 28 February 2012. ↑ "The Trail of the Easterlings" (PDF). 1949. Retrieved 2016-09-18. ↑ Accounts and Papers of the House of Commons: 1866. Second. House of Commons. 23 March 1866. pp. 14–15. OCLC 11900114. 1 2 Tunis, Edwin (1999). Colonial Craftsmen: And the Beginnings of American Industry. p. 81. 1 2 3 Martello, Robert (2010). Midnight Ride, Industrial Dawn: Paul Revere and the Growth of American Enterprise. p. 42. ↑ Tunis, Edwin (1999). Colonial Craftsmen: And the Beginnings of American Industry. p. 83. ↑ Martello, Robert (2010). Midnight Ride, Industrial Dawn: Paul Revere and the Growth of American Enterprise. pp. 42–43. ↑ Martello, Robert (2010). Midnight Ride, Industrial Dawn: Paul Revere and the Growth of American Enterprise. p. 107. ↑ Martello, Robert (2010). Midnight Ride, Industrial Dawn: Paul Revere and the Growth of American Enterprise. p. 109. ↑ Kauffman, Henry J. (1995). The Colonial Silversmith: His Techniques & His Products. p. 126. ↑ Falino, Jeannine; Ward, Gerald W. R., eds. (2001). New England Silver & Silversmithing 1620–1815. p. 156. ↑ Watt, Susan (2003). "How silver reacts". Silver. The elements. Tarrytown, NY: Marshall Cavendish. p. 13. ISBN 0-7614-1464-9. All About Antique Silver with International Hallmarks, 2nd printing (2007), by Diana Sanders Cinamon, AAA Publishing, San Bernardino, CA. Origins: A Short Etymological Dictionary of Modern English, by lexicographer Eric Partridge. Silver in America, 1840–1940: A Century of Splendor, third edition (1997), by Charles L. Venable; Harry N. Abrams, Inc., New York, NY. Tiffany Silver Flatware, 1845–1905: When Dining Was an Art, by William P. Hood, Jr.; 1999; published by the Antique Collectors Club Ltd., Suffolk, England. The Encyclopedia of American Silver Manufacturers, revised fourth edition (1998), by Dorothy T. Rainwater and Judy Redfield; Schiffer Publishing Ltd., Atglen, PA. The Book of Old Silver, English – American – Foreign, With All Available Hallmarks Including Sheffield Plate Marks, by Seymour B. Wyler; 1937; Crown Publishers, Inc., New York, NY. International Hallmarks on Silver Collected by Tardy, 5th English Language reprint (2000); original publication date unknown, date of first softcover publication 1985; author unknown; publisher unknown. Falino, Jeannine; Ward, Gerald W. R., eds. (2001). New England Silver & Silversmithing 1620–1815. Boston: Colonial Society of Massachusetts. Kauffman, Henry J. (1995). The Colonial Silversmith: His Techniques & His Products. Mendham, NJ: Astragal. p. 42. ISBN 978-1879335653. Tunis, Edwin (1999). Colonial Craftsmen: And the Beginnings of American Industry. Baltimore: Johns Hopkins UP. ISBN 978-0801862281. Martello, Robert (2010). Midnight Ride, Industrial Dawn: Paul Revere and the Growth of American Enterprise. Baltimore: Johns Hopkins UP. ISBN 978-0801897580.